This week in Advent is about Courage. The courage to “lift up our heads and see”, the courage to be like John the Baptist and announce the good news of Jesus’ coming. THE WREATH: The wreath itself is a circle. It begins and ends with the love of God for all humanity. Candle One at Holy Trinity: We are using a liturgy from LEAD this year so the first candle is about hope: for the future, for a present lived fully. 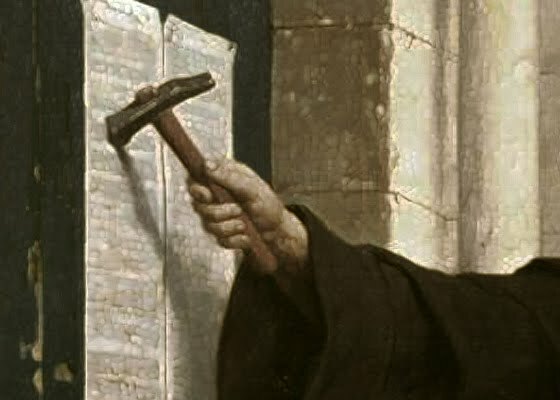 We will celebrate the beginning of the Lutheran Church, when Martin Luther nailed his 95 theses on the church door in Wittenberg, Germany. We will have a festive worship service that concludes with a German potluck afterwards. Please join us! The church in Jerusalem began the tradition of processing en masse from the Mount of Olives into Jerusalem for worship at the beginning of Holy Week. This is the only time in the church year when we hear the entire passion story. Together these two things, praise and passion, are at the heart of our liturgical tradition. With nightfall our Lenten observance comes to an end. At the heart of the Maundy Thursday liturgy is Jesus’ commandment to love one another. As Jesus washed the feet of his disciples, we are called to follow his example as we humbly care for one another, especially the poor and the unloved. At the Lord’s table we remember Jesus’ sacrifice of his life, even as we are called to offer ourselves in love for the life of the world. This is the night we hear the seven last words of Christ. In keeping with the Tenebrae tradition, candles and lights in the church will gradually be extinguished. The gradual darkening of the church portrays the diminishing light of the world as Christ was departing from it. The “strepitus,” a loud noise during the time of darkness will suggest the earthquake at the moment Jesus’ died. Please leave in meditative silence when you are ready. The language of being raised from death relies on the commonplace human idea that up is good and down is bad. In today’s readings, God raised Jesus, and we feast upon the mountain. The language is symbolic: up is life and down is death. Christians see the empty tomb as changing things dramatically. Death has been destroyed and no longer keeps us from life eternal. What is it? : The ELCA website describes this as a five-part resource developed by ELCA Presiding Bishop Elizabeth A. Eaton and the ELCA Ecclesiology of a Global Church Task Force. According to the resource introduction the goal is to “invite reflection, conversation and discernment about what being the church means today” and “strengthen the mission and ministry of congregations and the ELCA as a whole by going back to our spiritual roots.” The first four sessions focus on the four emphases Eaton has identified for the ELCA: We are church. We are Lutheran. We are church together. We are church for the sake of the world. The fifth session addresses the ELCA’s relationship with its global and ecumenical partners, particularly The Lutheran World Federation. On February 18, 7pm. Holy Trinity and St. Paul’s Lutheran will combine once again for the Ash Wednesday service. This is a service where we focus upon our mortality to start the Lenten season of prayer. We pray to prepare ourselves to walk with Jesus into Jerusalem, through the cross. St. Paul’s Lutheran can be found at 1300 Tuolumne St in Vallejo. As the year 2014 comes to a close, it is not necessary to review the year, but I thought it could be a fun endeavor. Many things have happened at Holy Trinity that brought joy to many. I was called to the pastor of Holy Trinity and officially started my ministry on Easter Sunday! I marched in the SF Pride Parade with people from St. Paul’s Lutheran, Vallejo and many other Lutherans. Yay Lutherans! We hosted a stranded youth group from MN in our fellowship hall. We had two joint services with St. Paul’s Lutheran, Vallejo for Reformation Sunday and Thanksgiving. Holy Trinity sent voting members to the Sierra Pacific synod assembly for the first time in many years. Holy Trinity encouraged my efforts at engagement with the community. These are just a few of the many wonderful things that happened with me and Holy Trinity during the year 2014. I also have to say that the people at Holy Trinity have been very supportive of me and my ministry as well as being very generous! I look forward to moving into the year 2015 as we will do many more wonderful things together! Join us for Epiphany Sunday Jan 4, 2015! Join us for worship on Sunday October 5 as we celebrate the Feast of St. Francis with a pet blessing. Bring your pet for a blessing or bring a picture of your pet.